Now I must admit, this post is just as much for me as it is advice for all the beauty horders out there. I do love a good drawer bursting with makeup, but I've found that life is so much simpler when everything in it are products I love and reach for often. So here's how to keep your makeup collection to must-haves. Shop your stash whenever you're in the mood for a new makeup purchase. Chances are there's a product you haven't given much love that'll feel like a new product to you! Plus shopping your stash can always uncover products that have gotten tucked away that may need to be tossed. Check expiration dates and take them seriously. Toss any products that are too old to use. Be brutally honest with yourself about some product categories. I for one have way too many blushes at any given time. There's only so many ways you can do pink, so be honest and keep only one or two blushes of a shade. Keep an area for favorites and see which products are constantly in it and which ones aren't. The products that never end up in that area should probably find a new home since you clearly aren't using them. Start a project use-up to get rid of the remaining bits of products lingering around. That way your drawers will be less cluttered and you'll be able to really see the products you may have been neglecting. I always end up having four to five mascaras open at one time and really have to focus to use them up. Finishing just one or two always makes a huge difference in that bin. Don't allow for overflow into other areas. I keep all my makeup in one drawer and don't allow myself to merge over to anything else. 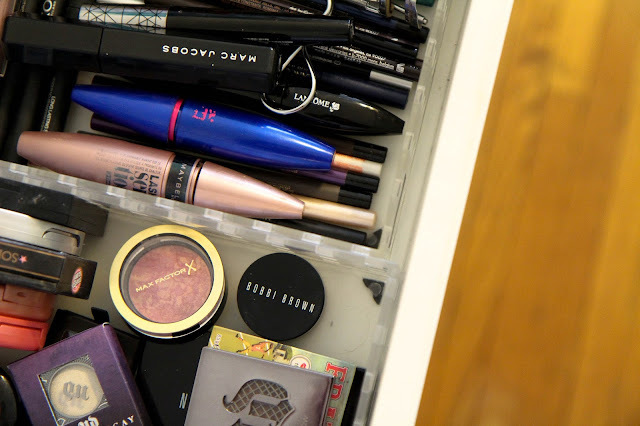 Having a set amount of room for beauty and makeup means you'll have to really get picky when the drawer fills up. Use the one in one out method for buying new makeup if it just can't be avoided. If you get a new blush, get rid of something else to make room for it. This really works with the tip to not allow for overflow. I love makeup like the next girl, but keeping my stash to must-haves makes things so much easier in the mornings and reduces serious makeup stress.